Marriage is the most awaited occasion in one's life. It is the celebration of two souls coming together and getting united to be inseparable for the rest of their lives. It is often seen that brides to be are very nervous before the D-day. But this fact is undeniable that the grooms to-be are more anxious than the brides. With marriage, new responsibilities and expectations come free. 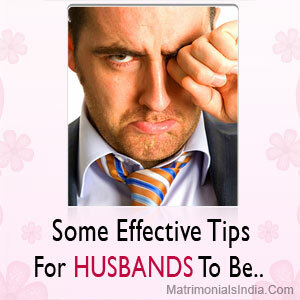 So, it is required for the husband to be more responsible and handle every situation with maturity. Remember, marriage is like a recipe whose main ingredients are love, understanding, trust, and commitment. Understanding Is The Key : For a successful marriage, you need to learn everything about your partner. So, you need to understand your wife very well. This will help you in the future because initial understanding acts as a base of a strong relationship. Respect Your Partner : A woman expects a lot from her husband and she looks up to him for even the smallest of her needs. As a responsible husband and a reliable partner, you need to understand her value in your life and the most important thing is to respect her for everything. Make Her Feel Blessed : Marriage makes you share everything with your spouse, right from your surname to your room. You should not make her feel uneasy about new things. Instead make her feel at ease by helping in the transaction. Along with this, be with her when it is required but also respect her private space. Lend A Helping Hand : A Marriage is all about sharing and caring, so try to help her in every possible manner be it some household stuff or professional guidance. Remember, marriage is about sharing your life and sharing starts with small and simple things. To sustain a marriage it's important to put in your individual efforts. Moreover, remember that marriage depends on finding the right person and most importantly being the right person for your partner.